Before actually making the wreath, you have to decide which flowers you'd like to use. Of course, the most popular colors for Memorial Day flowers are red, white and blue, so blooms in those hues are a great place to start. Look for red roses, carnations and gerberas, as well as white roses, carnations and lilies. Blue flowers are a little more difficult to find, but hydrangeas and delphinium are a perfect shade. Red poppies are traditional flowers used to celebrate Memorial Day, so they're a perfect addition to your wreath. Poppies have been worn on Memorial Day for decades to honor fallen soldiers and veterans. The tradition comes from a WWI-era poem called ""In Flanders Fields," which was written by Canadian Lieutenant Colonel John McCrae. After deciding which flowers you'd like to use, you should then decide whether you'd rather make the wreath with real flowers or fake ones. Real flowers provide an authentic and beautiful look, but if you use silk flowers, your wreath could last years longer. 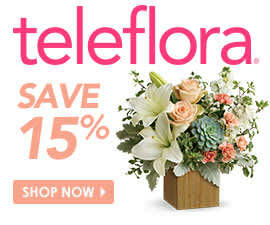 If you decide to go with silk flowers but still wish to celebrate the men and women who died in service with a real arrangement, Teleflora's America the Beautiful and With Distinction bouquets make stunning centerpieces. To make your wreath, you'll first need to gather several craft materials. Choose a foam, wire or grapevine base from your craft store – foam and wire will need to be covered with moss, while grapevine looks more natural. Make sure you have enough flowers and foliage, and pick out any accessories you'd like to use. A small American flag or red, white and blue ribbon would add to the patriotic aesthetic beautifully. Finally, pick up some hot glue to attach everything to the wreath base. First, if you have any large accessories (like flags, for instance) attach those to the wreath base using hot glue. If you've chosen a foam or wire base, cover it in craft moss. Then, choose your largest flowers and arrange them around the accessories and the rest of the wreath. These will create focal points. Stick the stems into the base, and attach with glue. Arrange the rest of the flowers and foliage around the first ones, trying to cover the wreath as completely as possible. If you decided to use ribbon, decide how you want to add it to your wreath. You can use some to tie a pretty bow, gluing it to the bottom or top of the wreath. Or, you can wrap ribbon in a spiral pattern around the entire form. Once your wreath is finished, it will be ready to hang! Choose a spot inside your home if you're having people over for Memorial Day, or hang it on your front porch to show your support for the men and women who are serving – and have served – the country.